Are you ready to incorporate your Nebraska business? Sure, you can pay a local lawyer several hundred or even a few thousand dollars. Or another option: You can pay an online incorporation service several hundred dollars. And hope you don't fall through the cracks. You can just incorporate your business yourself using the Do-it-yourself Incorporating in Nebraska kit. You'll get your corporation set up quickly and you’ll save hundreds of dollars. Specifically, for $37.95 you can purchase the complete edition of the do-it-yourself Nebraska Incorporation kit and then immediately download a 35+ page pdf document. The PDF document describes the benefits of using a Nebraska corporation for your active trade or business and then the kit explains in step-by-step fashion how to set up your Nebraska corporation in a few minutes, how to get a federal tax identification number for your new corporation so you can start banking and other financial activities, and how to elect to have your corporation treated for federal and state income tax as an S Corporation so you can maximize your tax savings. 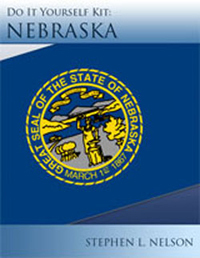 The Do-It-Yourself Nebraska Incorporation Kit documents were written by CPA Stephen L. Nelson and attorney Carl Baranowski. Incorporation expert Stephen L. Nelson has been a CPA for twenty-plus years, He holds an MBA in Finance from the University of Washington and an MS in Taxation from Golden Gate University. Nelson is the author of numerous best-selling books about accounting and finance including Quicken for Dummies which sold more than 1,000,000 copies and QuickBooks for Dummies which sold more than 500,000 copies. He's also taught limited liability company and S corporation taxation in the graduate tax school at Golden Gate University. An attorney for two-plus decades, attorney Carl Baranowski has worked both as an in-house corporate counsel and as practicing attorney, serving both private and public real estate and high technology companies. Baranowski holds an MBA and JD from Stanford University as well as two master's degrees and a bachelor's degree from Massashusetts Institute of Technology. A member of both the Florida Bar and the Texas Bar, he's also the co-author of the popular legal reference, Representing High-Tech Companies Law Journal Press, 2006. Note: We also sell another flavor of the Do-it-yourself S Corporation kit that uses a limited liability company as the platform for an S corporation. For more information about this product, which is also available as a downloadable do-it-yourself kit, visit the www.scorporationsexplained.com web site.